Wireless Full Function Remote Control system provides precise heat control. Electronic ignition system with battery backup-still ignites and heats during a power outage. From the convenience of your sofa, use your Full Function Remote Control to adjust the room temperature around the exact area where you are relaxing. Customers really love not only the look of our Superior DRI3030 Direct Vent Gas Fireplace Insert with Electronic Ignition but also the quality and the options it offers. You get to select the trim sizing (29" x 41", 29" x 48", 33" x 41", or 33" x 48"), the color of the face (either Mink or Black), and whether or not you'd like to complement it with Nickel or Gold trim. Make your fireplace more appealing than it currently is with the addition of this insert, which is designed to work with nearly any zero-clearance fireplace. Its enhancements also include a blower with six settings as well as a remote control for your convenience. My fireplace opening is 46.5". Will this unit with its surround kit cover this area?Thank you. Yes, there is a surround available for this insert with a 48" outside width as seen in the configuration section under "Choose Surround". What does the 20 year warranty of this Superior fireplace include? The full details of the warranty are listed on page 37 of the unit's product manual, which can be found here. 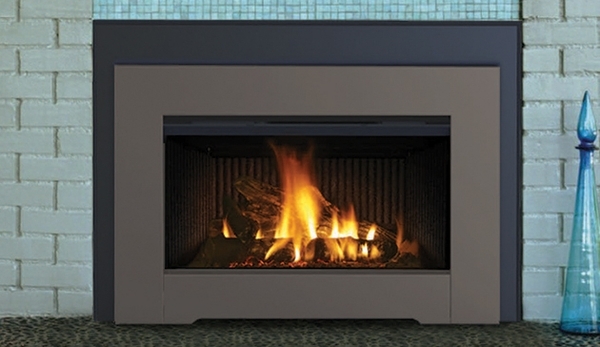 What is the viewing size of the glass of this Superior DRI3030 direct vent gas fireplace insert with electronic ignition? The viewing area is 27 1/2 inches wide by 11 1/2 inches tall. The unit appears to be a good buy. After ten years of using a ventless insert, I decided to get a vent system. The system fit well in my existing fireplace. The hook up and venting was easy to install using the recommended kits. The remote system works very nicely. ConsThe temperature switch for the blower was mounted in an area on the insert that was not hot enough to activate the switch. I needed to remount on a hotter area. Also, the switch I used appears to have a high temperature coefficient to activate (160 degree F vs most switches of 120 degrees).